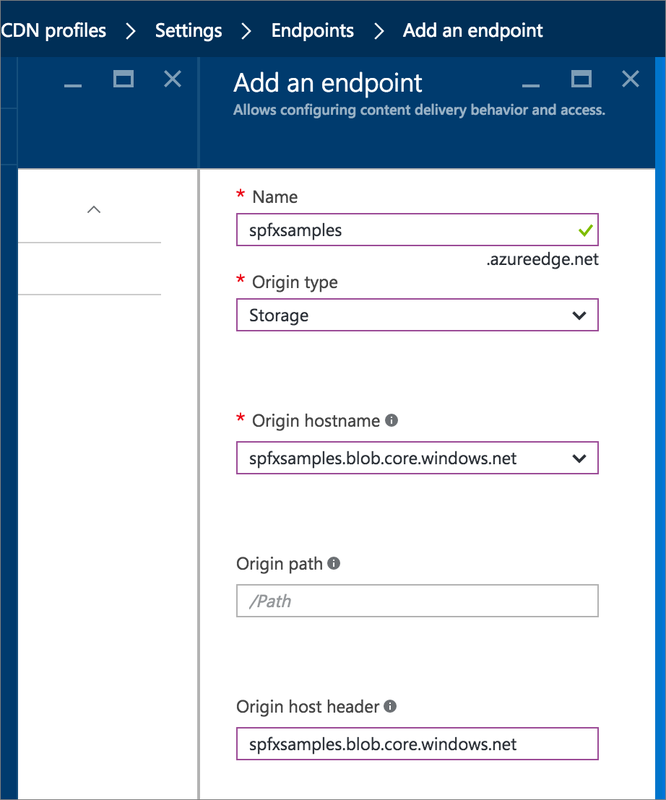 Create a new sample web part and deploy its assets to an Azure Content Delivery Network (CDN) instead of using the default Office 365 CDN as the hosting solution. 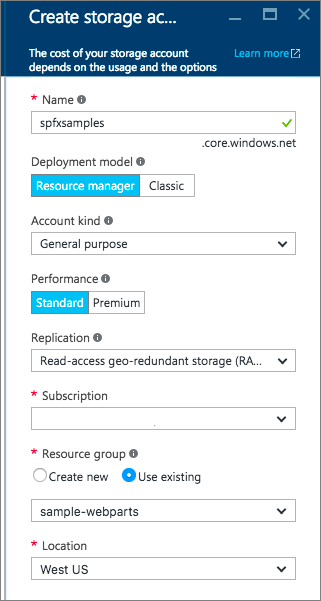 You'll use an Azure Storage account integrated with a CDN to deploy your assets. SharePoint Framework build tools provide out-of-the-box support for deploying to an Azure Storage account; however, you can also manually upload the files to your favorite CDN provider or to SharePoint. There are multiple different hosting options for your web part assets. 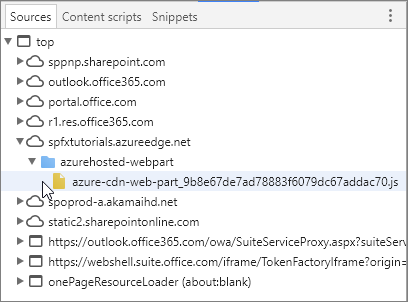 This tutorial concentrates on showing the Azure CDN option, but you could also use the Office 365 CDN or simply host your assets from SharePoint library from your tenant. In the latter case, you would not benefit from the CDN performance improvements, but that would also work from the functionality perspective. Any location that end users can access by using HTTP would be technically suitable for hosting the assets for end users. 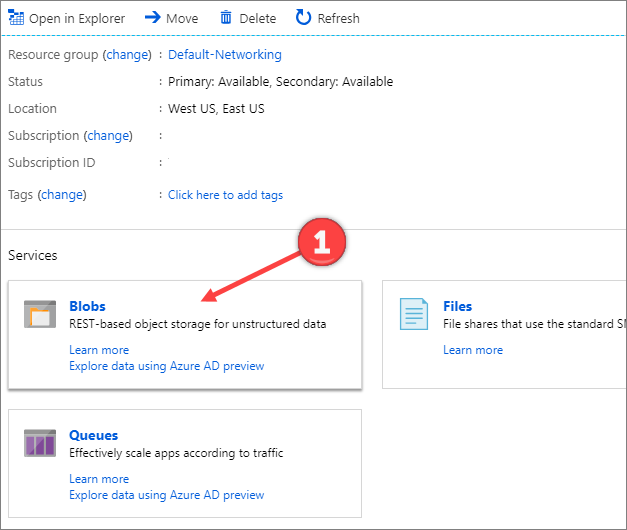 To configure an Azure storage account and integrate it with the CDN, follow the instructions at Integrate an Azure storage account with Azure CDN, along with the detailed steps in this article. As Azure UIs are evolving fast, some of the pictures and steps might be out of date, but high level process is still valid. This is the name you used to create your storage account, as described in Step 1: Create a storage account. For example, in the following screenshot, spfxsamples is the storage account name. This creates a new storage account endpoint spfxsamples.blob.core.windows.net. You need to create a unique storage account name for your own SharePoint Framework projects. Create a new Blob service container. This is available in your storage account dashboard. 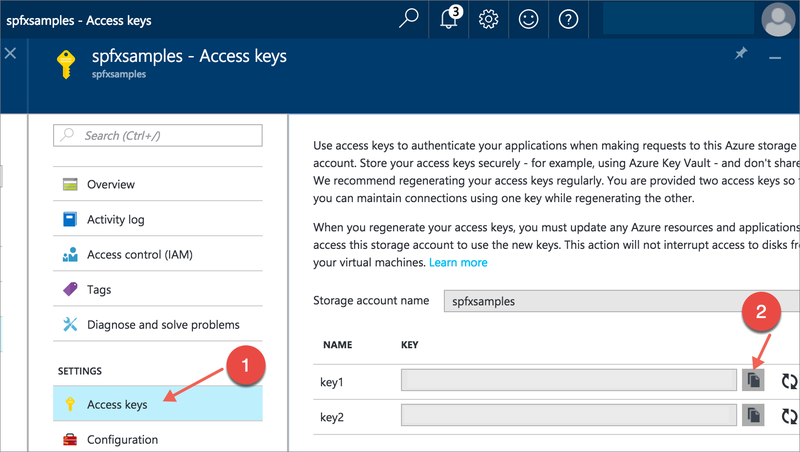 In the storage account dashboard, select Access Key in the dashboard, and copy one of the access keys. Create a new CDN profile and associate the CDN endpoint with this BLOB container. Create a new CDN profile as described in Step 2: Enable CDN for the storage account (scroll down in Step 2 for To create a new CDN profile). For example, in the following screenshot, spfxwebparts is the CDN profile name. For example, in the following screenshot, spfxsamples is the endpoint name, Storage is the origin type, and spfxsamples.blob.core.windows.net is the storage account. Note, however, that you have not yet deployed the files. 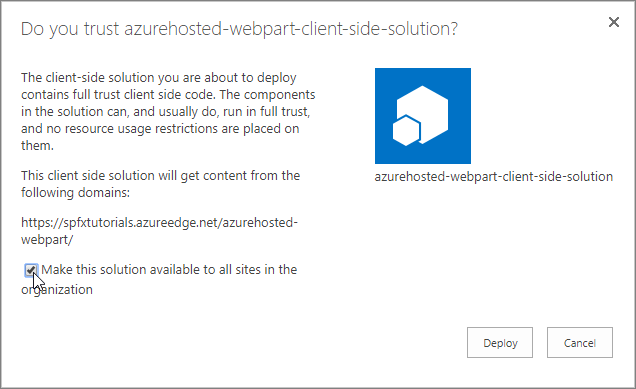 Accept the default azurehosted-webpart as your solution name, and select Enter. Select y to use the tenant-scoped deployment option, which makes the web part available across sites immediately when it's deployed. Use AzureCDN for your web part name, and select Enter. Accept the default AzureCDN description as your web part description, and select Enter. At this point, Yeoman scaffolds the solution files and installs the required dependencies. This might take a few minutes. Yeoman scaffolds the project to include your custom web part as well. Open package-solution.json in the config folder. This is where we control the solution packaging. Update includeClientSideAssets value as false so that client-side assets are NOT packaged inside of the sppkg file, which is the default behavior. As we are hosting assets from an external CDN, we do not want them to be included in the solution package. Your configuration should look somewhat like the following. The skipFeatureDeployment setting is here true because the answer for the tenant-scope deployment option was said to be 'y' in the Yeoman flow. This means that you do NOT need to explicitly install the solution to the site before the web part is available. Deploying and approving the solution package in the tenant app catalog is sufficient to make the web part available across all the sites in the given tenant. Open deploy-azure-storage.json in the config folder. This is the file that contains your Azure Storage account details. Replace the account, container, accessKey with your storage account name, BLOB container, and storage account access key respectively. workingDir is the directory where the web part assets are located. For the web part to load from your CDN, you need to tell it your CDN path. Switch to Visual Studio Code and open the write-manifests.json from the config folder. Enter your CDN base path for the cdnBasePath property. "cdnBasePath": "<!-- PATH TO CDN -->"
The CDN base path is the CDN endpoint with the BLOB container. Before uploading the assets to CDN, you need to build them. This builds the minified assets required to upload to the CDN provider. The --ship indicates the build tool to build for distribution. You should also notice that the output of the build tools indicate the Build Target is SHIP. The minified assets can be found under the temp\deploy directory. 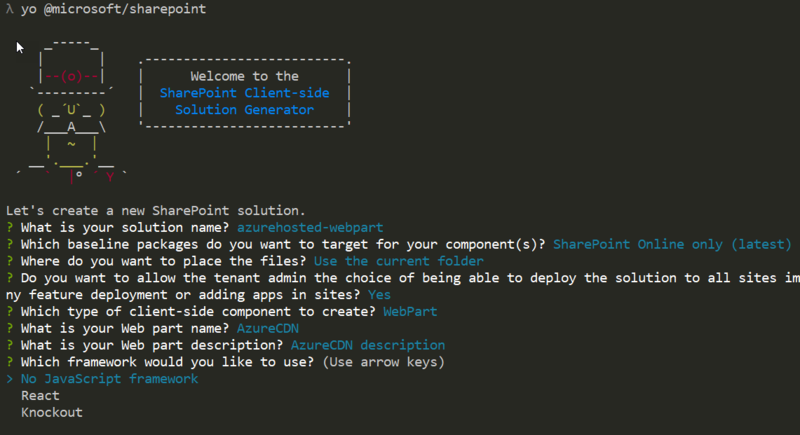 Switch to the console of the azurehosted-webpart project directory. Because you changed the web part bundle, you need to redeploy the package to the app catalog. You used --ship to generate minified assets for distribution. This creates the updated client-side solution package in the sharepoint\solution folder. Upload or drag and drop the client-side solution package to the app catalog. 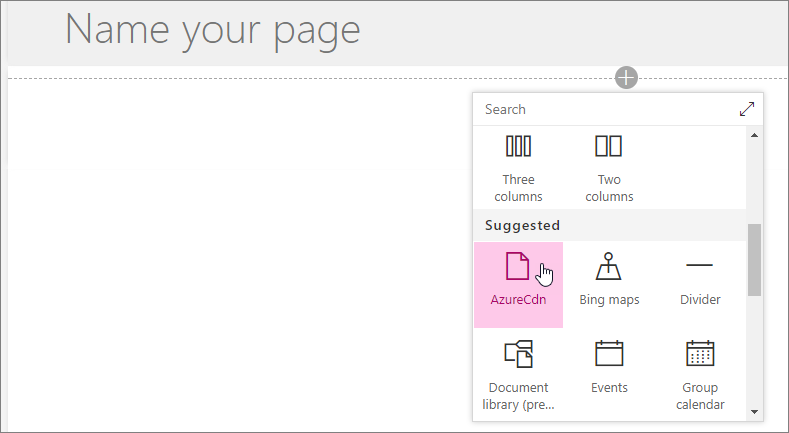 Notice how the URL is pointing to the Azure CDN URL configured in the previous steps. Select the check box to indicate that the solution can be deployed automatically across all sites in the organization. The app catalog now has the client-side solution package where the web part bundle is loaded from the CDN. Go to any SharePoint site in your tenant and select Add a page from the gears menu. Edit the page and select AzureCDN web part from the web part picker to confirm that your deployment has been successful. Notice that you are not running gulp serve, and therefore nothing is served from localhost. Content is served from the Azure CDN. 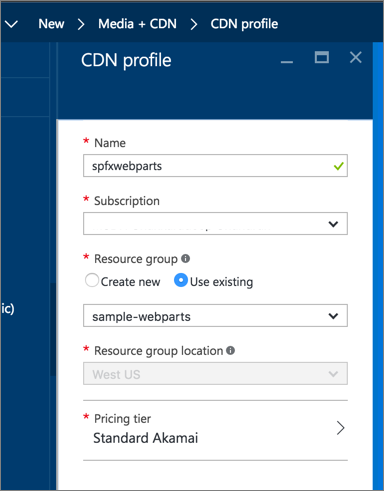 You can also double-check this by selecting F12 in your browser and confirming that you can see the Azure CDN as one of the sources for the page assets. As long as you are updating the cdnBasePath accordingly, your files are being properly loaded. If you find an issue in the documentation or in the SharePoint Framework, please report that to SharePoint engineering by using the issue list at the sp-dev-docs repository or by adding a comment to this article. Thanks for your input in advance.